The Mercury Diaries now on Amazon.com! Readers outside the USA should note that the book will be available on all Amazon sites worldwide in approximately a week or so–this applies to both Kindle and paperback editions of the book. Danny was just your regular London city bloke—until his health mysteriously went straight down the toilet. He did what any normal person would do: he went to see a doctor. And another doctor, and another, followed by tons of specialists. He asked them all the same question: Why? Why did his back hurt so much that he couldn’t even bend down to pick up his baby daughter? Why did he have ten days of heartburn if he ate anything besides salad? Why were his mind and body crumbling? Why was he so sick his life was falling apart? Over and over again, Danny was given fistfuls of drugs and no answers. Fed up with this, he decided to take charge of his own health and his own destiny. He opened the door and crossed the threshold into the mysterious world of alternative healing. Danny swore that he would try everything until he got his health back. This book is the chronicle of Danny’s adventures in the world of alternative healing. With wry humor, his search brings us through his first Alexander Technique session, his first herbal parasite cleanse, and his visits to a practitioner known only as ‘the muscle tester dude’. The pieces of the puzzle finally come together when Danny finds the online forums where the mercury toxic folks hang out. 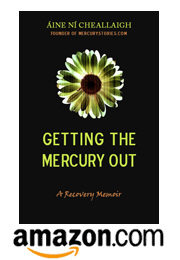 Discovering the many and varied symptoms of mercury poisoning—an exact mirror of his own health problems—it becomes blindingly obvious that he has mercury poisoning too. Danny embarks on mercury detox using the Cutler protocol, along with herbal cleanses and special diets. He climbs the long ladder out of mercury hell, and back into the land of the living. A changed man, glad to be alive, he shares his roadmap back to health so that others can find their way too. Countdown to ‘The Mercury Diaries’!!! Sitting in front of me on my desk is a shiny new copy of the book–the very first copy ever printed, the one the printers sent out to me to make sure that every last i was dotted, every t crossed. And let me tell you that it looks beautiful. Looking through it, I am so proud of the job Danny did. Not just in writing this book, but in cheerfully doing all of the grueling rounds of edits I insisted on! This book is a smooth and stylish read, with so many laugh-out-loud moments, and every paragraph imbued with Danny’s deeply authentic voice and experience. I truly can’t wait until everyone else gets to read this book. I am hovering over my computer, waiting for the moment when the paperback goes live on Amazon.com. As soon as it does, I’ll let you all know…..!!! Sneak Preview of The Mercury Diaries!!! It’s exciting times around here in this one-woman micro publishing house I run known as Capsule Press! 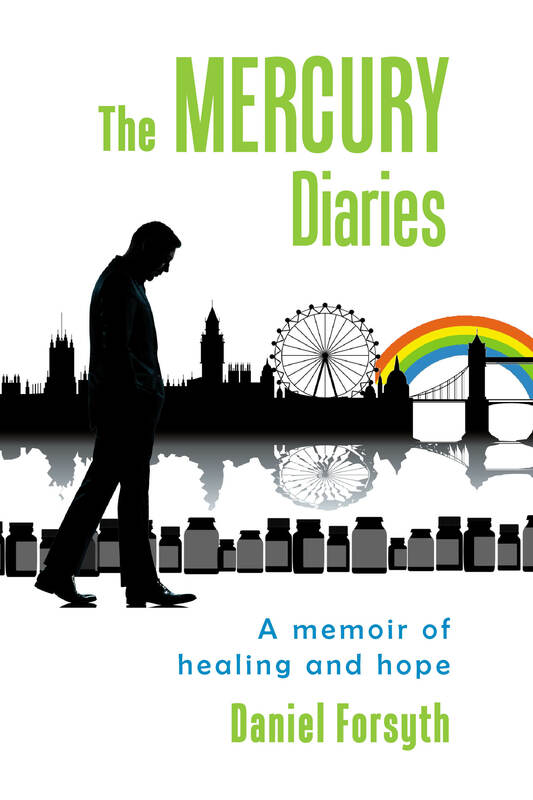 Daniel Forsyth’s recovery memoir The Mercury Diaries is in the final stages of editing and will be unleashed onto the world in just a matter of weeks. This book has been a long time coming: I saw the first draft of these early chapters, what, three, four years ago? I loved them then and knew that the world really really needed to see them. And you know what? They’re even better now. I truly cannot wait to share this book with you. So I’m not going to. Wait, that is. I’m giving you a little peek of the opening chapters, just so you can get a taste of the treat you have in store for you. I’ve written here before about how I’m in the process of training to be an Enneagram teacher. My training started two years ago, with a three-day course at the Enneagram Institute in Stone Ridge, NY. There I got to meet Don Riso, half of the Riso-Hudson team that wrote the fabulous book The Wisdom of the Enneagram. I was very interested to meet Don and talk to him, not just to discuss the Enneagram, but because we had another very big thing in common. We both had heavy metal poisoning. Don had been quite public about the fact that he suffered from arsenic poisoning. It started in 2007 when he was traveling in China and ate some contaminated fish. As is common with large, one-off heavy metal exposures, the arsenic attacked his peripheral nervous system and he suffered from neuropathy that turned to paralysis. He was hospitalized and almost died. What saved him was round-the-clock chelation treatment, and he made it through, even regaining some of his mobility. When I met him, what struck me most was his serenity in the face of this horrible ordeal. Me? I’m angry at mercury. It’s my enemy and I want to fight back. Don was in a much more peaceful place. He talked about what it was like to almost die. How he surrendered to the process and just accepted it, and even had moments of joy while his life was hanging by a thread. During that training, Don taught us for part of the time, and though he was having a hard time getting around, it was clear that his mind was clear as a bell. I really enjoyed spending time with him, hearing his quiet and gentle observations that were sharp as a tack. I saw him as someone I could learn from on so many levels–yes as a teacher, but also as a person. We are both Enneagram Type Fours, both writers. Talking to him over lunch about writing, I felt like I was getting a free master class on how to really go about being a non-fiction writer in the smartest and most fabulous way possible. I was looking forward to coming back to Stone Ridge this October for Part II of my training and talking to him about it some more. It really bothered me, what one student randomly said during that class. He was looking at Don struggling to get out of his chair, and he said, Well, I guess he won’t be with us for much longer. I held my tongue, but I wanted to snap back that he should shut the hell up, because a) saying something like that was extremely rude, and b) he didn’t know a damn thing about heavy metal poisoning, it didn’t kill people, it just left them injured and in pain for decades. But I guess I was understandably in denial about the gravity of Don’s condition. He passed away last week, dying in the end of metastasized cancer. I know that a lot of people will look at Don dying of cancer at the age of 66 as one of those random tragedies that happen all the time for no reason. I take it a bit more personally. I devote quite a bit of my time to fighting the good fight against heavy metal poisoning, and goddamn it, my teacher, one of the writers I admire most in the world got taken from me by arsenic. This gentle and sensitive man died because he ate the wrong piece of fish. What the hell are we doing in this world? Really? Letting corporations run wild, filling up the ocean with toxins of all kinds, burning through every ounce of coal on this Earth to make more, more, more electricity, releasing all kinds of toxins into the air that settle on the sea and make their way into all of us in the end. I mean is it really necessary? Does every man, woman and child on the planet need to have an iPad, a smartphone and high-speed internet access every nanosecond of their lives? Is all of that worth it, when the price we have to pay is autism, cancer, misery and people like Don Riso dying before I got a chance to hear everything he had to teach me? You bet I’m angry. From what I hear about his death, I don’t even think Don was angry when he died. He was smarter than me, he accepted that this is just how things are. Most of the time, I accept it too. I know that people die in their millions in every era for senseless reasons at the hands of those in power. This is just how it goes now, at the beginning of the 21st century. This is how the weak are sacrificed these days. Oh, but I don’t want it to be like this. Can we turn back the clock, take all the evils in the world and stuff them back in Pandora’s box? If I throw away my smartphone, can I have Don Riso back? I’m always on the lookout for new chelation stories to add to my list. So I was very glad to come across the new blog by Rebecca Claire called Saving Savannah. Rebecca started the blog to tell the story of her daughter’s recovery from autism using Frequent Dose Chelation. But unlike other chelation blogs, this isn’t a live round-by-round account of a parent’s struggle to recover their child. It’s more like a retrospective–Rebecca’s daughter recovered years ago; she’s a neurotypical 6th grader now. With the distance and perspective that only time can give, Rebecca tells the story of her daughter’s autism and recovery in beautifully written installments. I highly recommend that you start with the post Autism Is Like an Amusement Park Ride and read the posts sequentially by clicking on ‘next’ to get the full story. It really is remarkable. 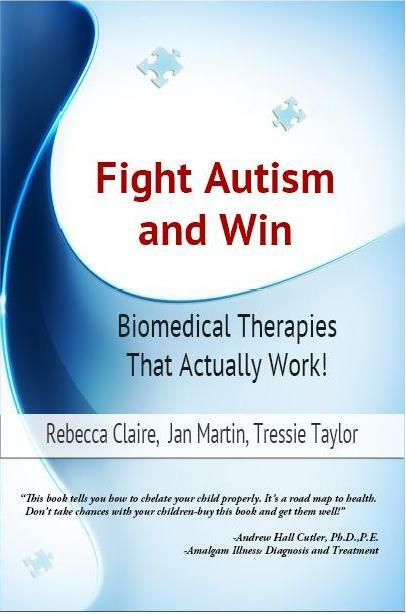 Rebecca is one of the authors of the book Fight Autism and Win, a guide to treating autism using Frequent Dose Chelation. Maybe you’re like me, and you read the book and wondered, But who is Rebecca Claire and why is she writing this book? Well, this blog is the perfect complement to the book and will answer all your questions about what Rebecca had to go through to get to that place of hard-won wisdom and expertise. I don’t like to waste my money and time on doctors. I hate that feeling I get in a doctor’s office, when they’re explaining something to me and I’m thinking, “Really, three hundred bucks and that’s all you’ve got? I know ten times more about this from a quick google search I did last night.” So when I do show up at a doctor’s office in a fasting state, ready to drop a pile of cash, it’s because I’m hoping to learn something new and interesting. Turns out Dr. Peter D’Adamo, author of Eat Right for Your Type was a pretty interesting guy. I posted last time about the fact that I’m a non-secretor. I’d never heard before that an aspect of your blood type could compromise your ability to fight candida, and increase your likelihood of getting dental cavities. Reading that there was a connection between these two very significant issues for me–the dental cavities that started my mercury journey and the fungal rash that lingers after its end–really rang a bell for me. Would D’Adamo be able to explain why I can’t shake this fungal rash? Or would he shrug and offer another prescription antifungal that would screw up my liver and make me miserable? My visit to his office began with a very interesting series of diagnostic measurements. My fingerprints were examined, the length of my legs were compared to the length of my torso, a strip of paper was placed on my tongue and I was asked how it tasted (my answer was “nasty!”) All of these measurements and more were plugged into the computer to come up with my individual dietary plan that is a lot more refined than the basic blood type A diet. If you would like to duplicate this process at home, a simplified version of the test appears in D’Adamo’s book The GenoType Diet. After my individual diet plan and recipe book were printed up, I got to ask Dr. D’Adamo my three big questions. How exactly did being a non-secretor cause my fungal rash? Would I have to stay on Nystatin for the rest of my life? Would I ever be able to eat sugar? Question 1 brought on a tidal wave of seriously scientific terms that I had never heard of before and couldn’t begin to absorb. I told him to slow right down, and to spell this one: myeloperoxidase deficiency. As a non-secretor, I just don’t make enough of this enzyme and can’t control fungal infections as easily as secretors do. As for question 2, would I have to stay on Nystatin forever? No, of course not. I just needed to take a supplement that would increase my myeloperoxidase instead. I have to say, I really liked that answer. I don’t like to have to take a drug, even one as mild as Nystatin. Taking a supplement that addresses the root cause of a problem rather than putting out the fire after it has started is a much more comfortable option for me. We discussed some other supplements I could try to boost my immune function and help heal my digestive tract, but always with the goal in mind to let my body heal and find its balance eventually with diet alone. D’Adamo’s approach is to always let the body find its natural healthy balance, not to fine-tune an unhealthy system to try to erase symptoms. This all brought me up to question 3–if I was going to be on this diet for the long haul, what were D’Adamo’s views on cheating? Would I ever get to eat a bite of birthday cake, or would that erase all of my good work? But of course the proof is in the pudding–will this dietary shift and these supplements clear up my fungal rash and let me quit Nystatin? My teeth were such a mess when I was a kid. My baby teeth were brown and rotten by the time they fell out. And then as a teenager, I had eleven mercury filling placed in the space of a month. Until recently, I never really questioned the sorry state of my teeth very closely. I just blamed it on the fact that I was addicted to sweets and couldn’t be bothered brushing my teeth regularly. It all started when I went to the doctor for my annual physical in the Spring. She drew my blood, I learned about my abysmal ferritin levels which you can read about here, and I asked her if she could shed some light on my last lingering mercury symptom–a fungal rash called tinea versicolor that appears on my skin intermittently and gets very pronounced if I eat sugar. Being a holistic doctor, she had lots of good suggestions–wearing breathable fabrics, washing my clothes daily etc–but I was disappointed to hear nothing new. Not only had I heard all of these suggestions before, these were all practices I carried out to a T in my everyday life and still this damn fungus lingered. I didn’t and so she added it to my list of blood tests and I went home and Googled “blood type diet”. Soon I started to read some very interesting books by Dr. Peter D’Adamo, the naturopathic doctor who has written extensively about the blood type diet. I started incorporating some more of the type A dietary suggestions into my diet as I read these books, and instantly felt a noticeable change–I felt less hungry. I wasn’t tempted to overeat because the foods I was eating felt satisfying. They also were helping to heal the lining of my gut. As I read more of D’Adamo’s material on blood type, I kept coming across this distinction he made between what he called ‘secretors’ and ‘non-secretors’. There was a test, apparently, that could tell you if you were secreting your blood type antigen into your bodily fluids (a good thing that would help you stave off bacteria and other nasties) or if you were a non-secretor who genetically lacked that first line of defense. Reading about non-secretors here and here, I got a sinking feeling in my gut. This beleaguered minority were more prone to dental cavities because their saliva lacked the antigens that helped kill oral bacteria. And they had a devil of a time fighting off candida and other fungal infections that secretors killed off effortlessly. At the same time, I was really hoping that I wasn’t. Being a non-secretor isn’t something you can change. You can’t cleanse it out of you. There isn’t a supplement or drug you can take for a year that’ll flip you from being a non-secretor to a secretor. It’s a genetic flaw. It’s for life. And of course I have that flaw. I’m a non-secretor. It really bummed me out when I got the result of that test. Up to now, I’ve really believed in my bones that everything wrong with my health is fixable. It’s a pretty reasonable of me to believe this, given my track record of fixing a really large number of seriously intense symptoms with chelation. I’ve been getting stronger, better, healthier, faster, with every hurdle I’ve overcome and now, splat, it’s not a hurdle, it’s a genetic brick wall I’ve run into. Can you tell I don’t like this non-secretor thing even a little bit? You know you don’t want to miss it–click here to subscribe!